Fall is in the air, which means pumpkins are finally back in season. It’s impossible to walk one block in any direction from the apartment rentals in Manhattan without finding a delicious Fall treat. If you’re looking for the best of the best in pumpkin delicacies, then these 10 desserts are top of the line. One of the first signs that Fall has arrived is the line forming on Grand Street outside of Doughnut Plant. Their pumpkin concoction is the real deal (nothing artificial here) and is topped off with caramelized pumpkin seeds and a spiced glaze. Hints of cloves and cinnamon really pull the flavor together, delivering what might be the best doughnut in all of Manhattan. You can order this pastry in cake or yeast form, both of which are delicious. Several patrons claim the cake version is even softer than Doughnut Plant’s usual lineup, which makes this an extra special treat in autumn. You can find incredible banana pudding at Sweet Sunshine all year-round, but this famed bakery on the Lower East Side debuts its pumpkin pudding once October finally kicks in. This messy pudding treat in a cup comes mixed with whipped cream and topped with crumbled pumpkin cake layers. To top it all off, the company throws in a dash of eggnog pudding. This is one Manhattan delicacy you don’t want to miss out on. Fat Witch is known for their signature, buttery brownie. 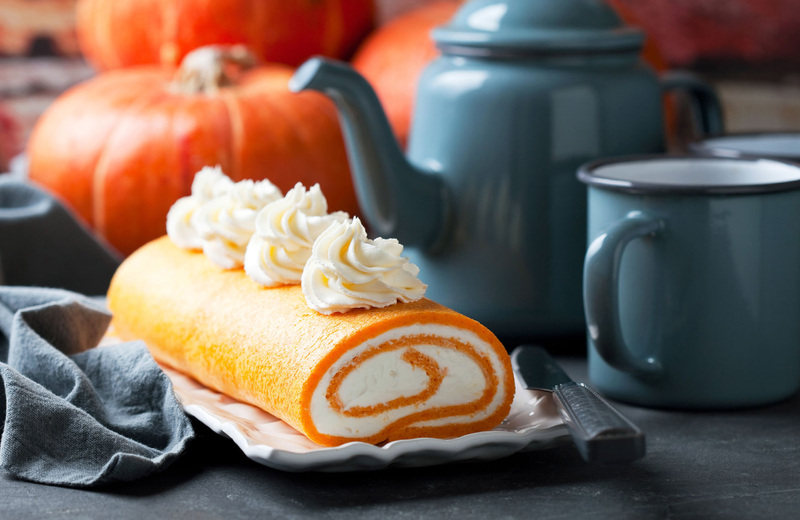 This particular treat is a deviation from the norm, featuring thick pumpkin cake as its base. Gently spiced and doused in cinnamon, it’s an incredible pumpkin creation. Pair it with your favorite seasonal coffee for a real treat. At first glance, you might think this is just a piece of pumpkin cheesecake. While the two are similar, Nuage is by far the more decadent delight. Cream cheese is replaced entirely with pumpkin in the creation of this pastry, sticking with a traditional graham cracker crust. It’s light on the spice and heavy on the melt in your mouth goodness factor. Imagine frozen pumpkin pie, and you have a pretty good idea of what Sundaes and Cones creation tastes like. Created with real pumpkin as opposed to flavoring, the taste really comes through in each bite. Skip the cup and pair it with a sugar cone to complete the experience. Il Laboratorio is the go-to place for gelato in Manhattan. They eat, sleep, and breathe excellence. This time of year, they unveil their surprisingly un-sweet pumpkin cream flavor. It’s a unique blend that comes through rich on the palette while leaving a lingering taste of pumpkin long after you’ve finished your cup. The company also creates a butternut squash flavor for Fall, which is equally delicious in its own way. If you’re a gelato fan (of course you are, this is New York), then grab a small size of each and enjoy fall in all its glory. You’ll have to wait until the first week of November for this renowned pumpkin delicacy. Topped with toasted pumpkin seeds, rich in butter, and lightly spiced, this moist cake is more than enough to have a line wrapped around the building. If you can, grab one on your way to work and pair it with their house-made apple cider. This unusual cupcake relies on the flavors of pumpkin, nutmeg, and cinnamon in pasty half. On top you’ll find a thick swirl of cream cheese frosting lightly dusted with extra cinnamon and nutmeg. What makes this particular creation stand out are the chunks of pumpkin baked into the batter. For as small as it is, it packs a bold flavor that screams all things fall. It shouldn’t come as a surprise that the ChickaLicious Dessert Club has a must-try pastry this time of year. Their puff utilizes a traditional pie crust with puff pastry on top, both of which cradle the spiced pumpkin filling in-between. Each puff looks as delicious as it tastes, and the added cinnamon and nutmeg really tie the flavor together. If you’re a fan of this classic treat, then you absolutely have to try One Girl Cookie’s take on a pumpkin flavor. The cake in each whoopie pie is as fresh as they come, and the cream cheese frosting in-between is incredibly rich. Plus, it’s easy to take one on the go while you hit the subway or take a taxi. With fall in full swing and the temperature dropping by the day, there’s nothing quite like coming home a cozy, warm space to call your own. Renoir House offers its residents the quintessential New York City rental experience in the heart of the Upper East Side neighborhood. These newly redesigned apartments feature modern kitchens and baths with quartz countertops, each of which is elegantly accentuated by barnwood-style flooring. A renovated lobby with 24-hour concierge service, decadent corridors, and modern architecture paint the perfect picture of luxury living. Residents at Renoir House can choose to enjoy a collection of carefully curated amenities anytime they wish. The on-site gym allows them to stay in shape, while the roof deck provides sweeping views of the Lower Manhattan skyline. Common areas create entertainment just outside your door, while elevators make taking your furry friends outside less of a hassle. Of course, there’s always the landscaped patio. Your premier location at Renoir House places you minutes away from fine dining, high-end shopping, and world-class entertainment experiences waiting to be discovered. With numerous subway lines a mere block away, all of Manhattan is yours to explore. We invite to experience New York like never before. Renoir House redefines modern definitions of luxury living, elevating every aspect to create a one-of-a-kind-home within the city.